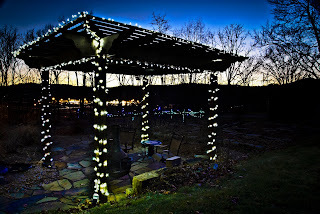 I took this image at at a friend's house at sunset to create a different 'Christmas Lights' look. I used a circular polarizer on the Tamron 17-50mm f/2.8 lens to reduce the light and increase the 'pop' of the sky. My camera was on a tripod set at f/10, 6 seconds @ ISO 200. Lightroom dodge and burning was used to highlight the furniture. Rather than shoot the typical Christmas lights shot, try shooting the image at sunset. This image was shot in manual mode [which is my favorite mode to use] and I adjusted the settings by eye. I knew I wanted good depth of field. Therefore, the reason for using f/10. I took a few shots with greater DOF but this image I liked the best. I'm not sure I would have thought to photograph Christmas lights at sunset had I not seen it done. It brings a whole other element to the photo just by changing the time of day and allowing more of the surroundings to become visible. Great tip!